Generally I don't take pleasure from other people's misfortune. The young lad you can see in the picture has recently appeared on the river, and persists in riding his inflatable at full speed up and down, round and round, and up and down, and round and round, for what seems like hours at a time. I know, and understand, he is a youngster just having fun and not really causing any harm. But after a while it wears a little thin on the nerves. Especially on an otherwise peaceful evening. Anyway, what is so delicious about this picture is that his engine quit while travelling up the river, against an outgoing tide with the added weight of his, presumably, less than enchanted, young female passenger to contend with. Payback! I'm sure there were people in the marina opposite silently cheering as well. I know more than one of them have shouted at the lad for speeding at one time or another. The wash of speeding boats affects them far more than me, obviously. You could imagine the groan going through the marina when this boat showed up, not long afterwards, and offered him a tow. I know I had a voice in my head saying "oh dear, he's not going to suffer as much as I'd hoped!". I hasten to add that he was perfectly safe where he was. His 'rescue' was really only from total humiliation as he rowed against the tide in front of everyone, not least of which the young girl he must have been trying to impress. I never cease to be amazed at the antics ging on around me. 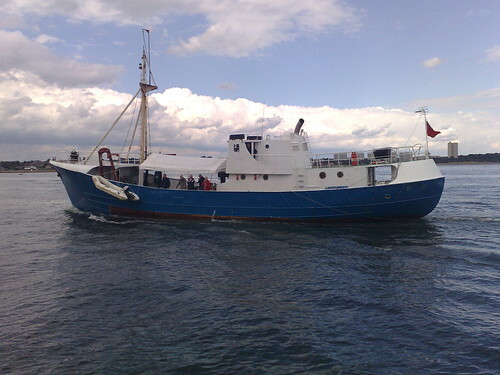 Here some people pulled up, chucked out their anchor, and started to fish. All of which is fine, except they were right in the main channel there. Surely they must have known it? Anyway, they were not there for that long - I assume one or more boaters had something to say to them. Not everything is going according to plan. 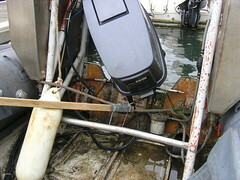 If you look closely at the picture, you will see my emergency steering setup on the rib (hbi). I can tell you that it's no easy thing steering the rib with a bodged up tiller. What happened was when I came to take the rib out on the weekend that we took Lady Jane out for a cruise, the steering stuck so I could only go round in circles. 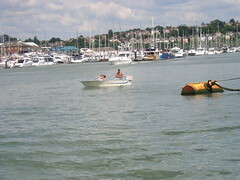 I then had to suffer the embarrassment of paddling the rib out to Lady Jane, where I could work on it. The steering rod, part of the steering cable, had got jammed solid where it runs through the engine mounting. After literally hours of hammering, jimmying, cussing and liberal application of WD40, all I managed to do was hurt my hand with a rubber mallet and make things worse. The rib has to come out of the water for this job, as there is no room to get the steering cable out without taking the engine off. Although the timing was really bad, the rib has been needing to come out of the water for a while now. This steering 'issue' just makes it a priority. Today marks the passing of exactly four years since I bought Lady Jane. The inset shows Lady Jane as she was just after I bought her, while the main picture shows her as she is now. What a four years it's been! I've met some wonderful people, learned a lot, had a laugh and literally given the old girl blood sweat and tears (and my money). Do I regret any of it? Not a bit. I still love the lifestyle, the challenges and the friendships this whole project has brought me. Following the colision with the Humber Star, I am now left to deal with the damage. Here Fred and I hoist the platform, Willcarry 1, back out of the water. That platform would make an ideal swim deck I was thinking. In my mind's eye, I had the idea that I could simply lift this onto Lady Jane's deck and take it with us on our travels. The reality is, that thing is much harder to lift out than I'd thought it would be, and covered in all sorts of marine growth underneath makes it smell somewhat when out of the water. Anyway, the task in hand is to repair this as soon as possible, so I can get it back in the water to work on the outside of Lady Jane's hull in the warmer weather. 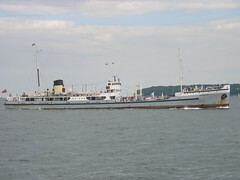 Here is the SS Shieldhall, a ship we passed when on our way back to Southampton. The SS designation indicates she is a steam ship. One of the last steam powered passenger vessels about. Now there's a massive on-going project. A visit to their website provides a tantalizing glimpse into how things must be on board, maybe even enough to warrant a trip on her sometime. 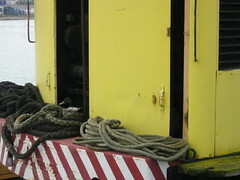 As with Lady Jane, I can't help but think how life must have been on board for the crew when she was a working vessel. I'm still basking in the afterglow of such a fun day on the weekend. For the people who are vicariously taking this voyage with me, here is a video clip of us travelling towards the Needles, taken from the wheelhouse. The 10 knots we were doing was on account of some assistance from the tide there. More pictures of the cruise are available here, in Flickr. "Southampton VTS this is Lady Jane with seven on board, heading down the east of the channel, then out to the west for engine trials". 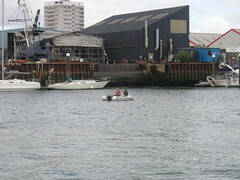 That was John reporting our intentions to Southampton VTS as we were leaving the River Itchen. Yup, we've been out for a cruise in Lady Jane!!!! We've actually been working up to this trip since mid April, when Skipper John left some charts with me. After a bit of a snag with the engine governor not responding like it should, it all came together and we set off in fine style. 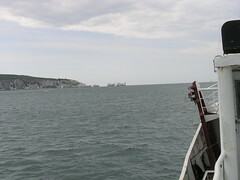 What fun to be out in Lady Jane again, we cruised on down past The Needles and out into the shimmery shiny sea beyond. Lady Jane performed impeccably, and we all got back safe and sound some seven and a half hours later. 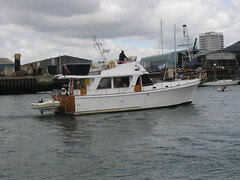 She is such a different vessel now, compared to how she was when we first took her round to Fareham. As our confidence builds, and as things come together more, the plan is to take her on progressively longer voyages. Malcolm for helping with the inflatable. This poor table has had a hard life. A far tougher life than could reasonably be expected of any table in fact. It is, after all, only supposed to be a garden table. Here Fred breathes new life into the poor thing after yet another 'leg failure incident'. Truth is, its the over-enthusiastic application of the circular saw that is mostly responsible for it's sorry state. What a weird place to do it. Believe it or not, there is a duck nesting in the back of the crane there. I sneaked a look when she left the nest, and saw she only had two eggs. It could be that she has laid more, as she does not get off the nest that often now. That could be on account of the male duck on guard at the entrance there. I would have thought it's a bit late in the year for a clutch of eggs, though I'm pleased to have a nest close by. Something else to help with the on-board procrastination. 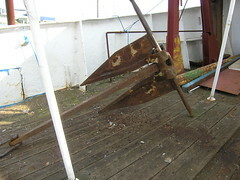 For over a year now, I've had this spare anchor kicking around on deck. 'Time to clean it up and paint it' I thought. 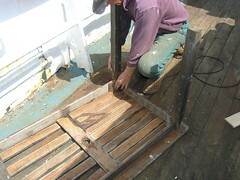 You can tell that with the warmer weather on us, the emphasis is now on work above decks. Hours of toil later, and I've only cleaned up just over half of it. As ever with this type of thing, it's always more work than you'd expect. 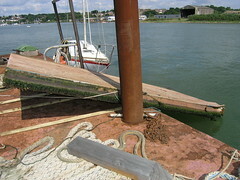 Still, I'm looking forward to a beautifully painted spare anchor gracing my deck, rather than that rusty old lump I've become accustomed to. For those of you who are interested, that puppy weighs 300lbs. The junk on Lady Jane mounts up surprisingly quickly. It doesn't seem like that long ago I did a tip run, with the rubbish produced from the various jobs on Lady Jane. Now, of course, a tip run is a little more difficult. I need a special permit to use the public waste disposal points. The issue is I have a truck, so trucks are limited to a maximum of 12 visits per year, and for household waste only. The sun is shining, and it's been a wonderful weekend, so I'm resisting having a rant about Hart District Council here. Anyway, the deck is looking so much better now, though I still cannot bring myself to throw away that 200 litre oil drum. I'm always so amazed at how much more work gets revealed as things get done. As soon as an area is cleaned up and painted, it immediately becomes obvious how much more detail there is that needs attention. It seems that your eyes are inevitably drawn to the relatively small defects, rather than the much more substantial, finished, stuff. Kind of like noticing a bogey hanging out of someone's nose I suppose. You see nothing else of that person, other than that bogey hanging there. 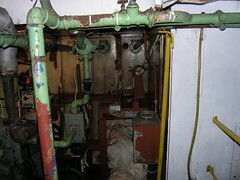 Painting down in the engine room is very much like that. Here Fred worked hard on the detail in the engine room all day, much harder than me I hasten to add, cleaning and priming in preparation for a coat of white paint. The rusty spots, even though they are nowhere near what Fred was working on, really stand out to me. Here's a fascinating picture, a warship being carried by another ship. Two ships inextricably linked by history. 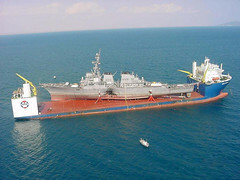 The warship is the USS Cole, the ship carrying her is the MV Blue Marlin". 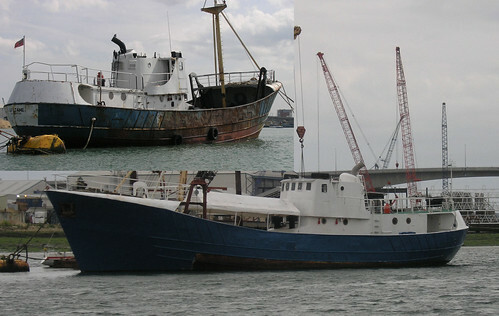 This was first brought to my attention through the Solent Area Shipping News site, a site well worth bookmaking if you are in the Solent area, for news and updates on happenings in the area. According to the site, the USS Cole is visiting Portsmouth, accompanying HMS Illustrious. I love the picture of what almost looks like a toy ship, balanced on another weird looking ship. At 154m (505ft), the USS Cole is some 5 times the length of Lady Jane. That is some engineering feat that. Semi-sinking a ship so that she can float her cargo on board, then lifting the whole lot up to travel.